NJC asks Buhari to dismiss two judges, Ofili-Ajumogobia, Agbadu-Fishim Following allegations of corruption against them by the Economic and Financial Crimes Commission, EFCC, the National Judicial Council (NJC) has recommended the dismissal of two Nigerian judges, Rita Ofili-Ajumogobia of the Federal High Court and James Agbadu-Fishim of the National Industrial Court of Nigeria. 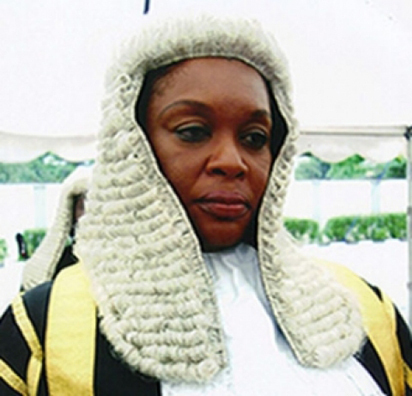 Justice Rita Ofili-Ajumogobia NJC made the recommendation to President Muhammadu Buhari in a statement by the commission’s Director, Information, Soji Oye, Esq. In the statement, NJC said its investigations into the allegations found the judges wanting. The commission also Rejected the voluntary retirement of a Judge, Justice Joshua E. of the Delta High Court, and ordered him to refund two (2) years’ salary and emoluments. Read the statement below: NJC recommends the dismissal of two (2) Judges; Reports one private legal practitioner to Disciplinary Committee; Rejects voluntary retirement of a Judge and orders him to refund two (2) years’ salary and emoluments; Issues letter of advice to one (1) Judge; Empanels Committees to investigate four (4) Judges of the Federal High Court. The National Judicial Council under the Chairmanship of the Honourable Mr. Justice Walter Samuel Nkanu Onnoghen, GCON, at its 87th Meeting which was held on 3rdOctober 2018, recommended the removal by dismissal from office, of Hon. Mr. Justice R. N. Ofili-Ajumogobia of the Federal High Court and Hon. Mr. Justice James T. Agbadu-Fishim of the National Industrial Court of Nigeria. Hon. Mr. Justice R. N. Ofili-Ajumogobia was recommended to President Muhammadu Buhari, GCFR, for removal by dismissal from office pursuant to the findings by the Council on the allegations of misconduct contained in a petition to the Council by the Acting Executive Chairman of the Economic and Financial Crimes Commission, Mr Ibrahim Magu, alleging that: Hon. Mr. Justice R. N. Ofil-Ajumogobia is a Director/Chief Executive Officer and sole signatory to Nigel and Colive Company contrary to the Code of Conduct for Judicial Officers of the Federal Republic of Nigeria; Several personalities, individuals, government officials and business partners lodged funds into various accounts belonging to the Hon.dge; and There was an ex-parte communication between the Hon. Judge and Mr. Godwin Oblah, SAN, during the pendency of his matter before the His Lordship. The Council, however, could not consider other allegations in the petition because they are already before a court where the judge is standing trial. Council left those matters for the trial to take its legal course. Hon. Mr. Justice James T. Agbadu-Fishim of the National Industrial Court of Nigeria was also recommended for removal by dismissal from office sequel to the findings of the Council on the allegations contained in another petition by the Acting Chairman of the Economic and Financial Crimes Commission (EFCC) alleging that the Hon. Judge received various sums of money from litigants and lawyers that had cases before him, and some influential Nigerians, under the false pretence that he was bereaved or that there was delay in the payment of his salary. This is contrary to the Code of Conduct for Judicial Officers of the Federal Republic of Nigeria. In the interim, the Council, in exercise of its disciplinary powers under paragraph 21 (d) of the Third Schedule of the Constitution of the Federal Republic of Nigeria, 1999, as amended, has suspended Hon. Mr. Justices R. N. Ofili-Ajumogobia and James T. Agbadu-Fishim with immediate effect pending their removal from office by the President of the Federal Republic of Nigeria. Council rejected the letter of voluntary retirement, purported to be with effect from the 1st of October 2018, submitted to it by Hon. Mr. Justice Joshua E. Ikede of the Delta State High Court. This followed the findings on an allegation of falsification of age contained in a petition written by Zik Gbemre, National Co-ordinator of Niger Delta Peace Coalition. Council found that the Hon. Judge ought to have retired since 1st October 2016. Consequently, it backdated his retirement to 2016 and recommended to the Government of Delta State to deduct from the retirement benefits of the judge, all salaries received by him from October, 2016 till date and remit it to NJC which pays salaries of all Judicial Officers in the Federation. Council also decided to issue a Letter of Advice to Hon. Mr. Justice K. C. Nwakpa of High Court of Abia State to guard against unwarranted utterances in matters before him. This was as a result of a complaint to the Council by one Princewill Ukegbu. Council considered the reports of various Investigation Committees and dismissed the petitions written against Hon. Mr. Justice Yusuf Halilu of the High Court of the Federal Capital Territory, Hon. Mr. Justice E. O. Osinuga of the High Court of Ogun State, and Hon. Mr. Justice E. O. Ononeze-Madu of the High Court of Imo State. The petition by Wema Bank against Hon. Mr. Justice Yusuf Halilu of the FCT High Court was dismissed because the allegation of misconduct was not established. The judge’s handling of the related matter did not amount to the alleged misconduct. The petition on allegation of inducement, bias and alteration of Ruling written by David Olawepo Efunwape, Esq. against Hon. Mr. Justice E. O. Osinuga of High Court, Ogun State was found to be false. Council, therefore, decided to report David Olawepo Efunwape, Esq., to the Legal Practitioners Disciplinary Committee (LPDC) for appropriate sanctions for making false allegations against a judge. The petition written by Hon. Eugene Okechukwu Dibiagwu against Hon. Mr. Justice E. O. Ononeze Madu was dismissed by the Council for lack of merit.Council also decided to warn the Petitioner and asked him to apologise to the Hon. Judge for the false allegation of inducement. New petitions written against twenty-six (26) Judicial Officers from the Federal and State High Courts were considered by Council, after which it resolved to empanel four (4) Committees to investigate.